View from a ’72 Benz C250 series, issue no. 1. Beirut’s service taxi drivers are more oppressed than usual these days. The new Interior Minister, Ziad Baroud, is proving his mettle by enforcing the long-ignored seat belt law, and so the chauffeuriyyeh are predicitably getting shafted, not least because most old cabs don’t even have working seat belts, just a sad little slot above the driver’s dandruff-covered left shoulder. 1. The talks are a good thing because they will help solve Lebanon’s internal strife and security problems. 2. Let’s hope they succeed. 3. They almost certainly won’t so let’s not get our hopes up. What is noteworthy about this pess-optimistic outlook is the apparent lack of cynicism regarding the sincere intentions of the two negotiating parties. Unlike the reading typically encountered among pro-resistance folks (i.e. that neither Syria nor Israel are serious about these talks and are each playing for time, for various reasons), the cabbies I met were willing to give the negotiations the benefit of the doubt, if not a realistic chance of success. However, the cabbie consensus is not a revelation: judging from their repetitive rhetorical questions, March 14th pols believe that there is strong support among a majority of Lebanese for an end to hostilities with Israel. Indeed scarcely a day goes by without Samir Geagea or Amin Gemayel wondering aloud about why Lebanon continues to resist while the mother of resistance negotiates. Less familiar (and annoying) faces might be able to make more hay out of this question than March 14th’s Christian leaders, but for the time being it, the FPM has been successful at dodging it. “We resist,” they say, “because we are still under constant threat, and because we have legitimate grievances.” And, given the fact that the Syria-Israel talks have been stalled for a while, the FPMers have a point: peace is not exactly on the horizon, so why even discuss resistance vs. negotiation? There are other, more urgent matters: the electricity fiasco, the national debt, the takfiri salafists in Tripoli, the upcoming Syrian invasion from the north (see previous post), the upcoming Israeli invasion from the south… plenty of things on our plate, no? Buckle that seatbelt. It’s the law! Congratulations on the blog. Love the idea of the ’72 Benz series! I am curious about something: which khatt(s) does this or your usual sample of respondents represent? But Qifa, how do I reach you? Do you see me on Facebook? But my internet access is sketchy. I don’t want to put my phone # online. email me directly… or call Youssef Bousaba in Mieh-Mieh, land line. Monday insha’allah I am traveling to Beirut for the day with my friend, it’s the only day we have free for Beirut during our stay. Tuesday we hope to go to Shem. What do the taxi drivers and office boy say about tourist trips to Sham this coming week? Do you see me on Facebook? But my internet access is sketchy. 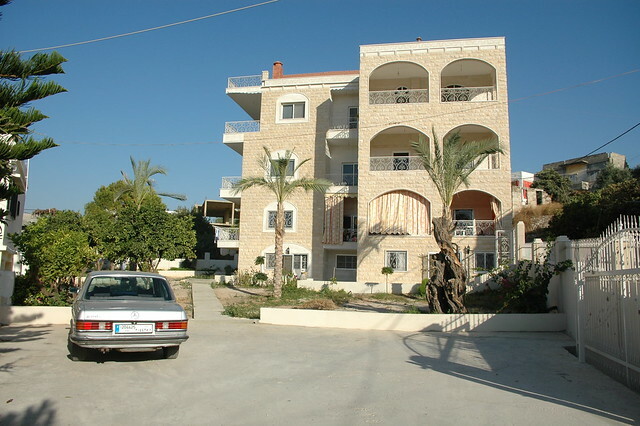 Also the house in the picture is my residence in Lebanon, my uncle’s place, formerly my grandparents’ home, where my father was born. (OK it was a tiny one room house then). Mieh-Mieh. Woops, sorry about that, screwed up cut and paste. There are a few different khatts involved. They all originate in Hamra because that is where I live, and go out from there and of course back again. Dashboard ornaments sometimes give away the confession/political persuasion of the driver, along with accent and discussion gambits. But what I’ve generally found is that most of West Beirut is politically fairly diverse, on the cabbie level. I would not be surprised if half of the drivers in this last exercise were pro-8 and the other half pro-14. Then again, I also believe that the vast majority of Lebanese are not pro- either 8 or 14. Ya’ni, they are more mature than their leaders. you just hang on for a couple of months and everything will be back to normal. Apparently it’s been like this the last five times with a new cabinet. A Lebanese version of ‘Yes Minister’ would be tops. I like the new blog so far. I have to say that I’m really, really happy with Ziad Baroud so far. He’s opened the ministry to civil society and is open to suggested reforms. Have you noticed the difference in traffic in Hamra because of his cleanup of the Spears Barbar street parking situation? It used to be backed up to Sanaya, but now it flows ten times smoother. With very little political support and none of the perks that a party machine entails (his office didn’t even have a printer), he’s made more positive changes in this country than anyone else I can think of. Otherwise, I’ve got little sympathy with the service drivers as far as seatbelts go, or any moving violation enforcement that may be enacted later. Before the war, half of these guys never would have been able to leave the garage after government inspections. I too am very happy with Ziad so far. I’ve liked him since he was an independent-minded lawyer with the Boutros Commission. (He was the only person to register an objection to the Commission’s proposals, I believe). No, I missed it, but I heard there were some ridiculous comments by members of our civil society. Stuff like, “why didn’t you resign when the election reform didn’t pass?” Ya rab! P.S. I really like your header. I too hope that he’ll be in the next government… I can’t imagine that he’ll be tapped for the Interior Ministry again, unless he does such a spectacular job that Suleiman figures he can’t not re-appoint him. But perhaps a minister of state, or director of a special commission to enact the postponed reforms. Are you in Beirut at the moment? You must be if you’re commenting on the traffic in Hamra. Yeah, I live in Gemmayzeh/Mar Mkhail and work in Hamra. I think we’ve got a certain German friend in common (Vanessa), because she sent me a link to your site. If you’re interested, you can check my blog out here. I took a service from Saida up to Mieh-Mieh. My uncle couldn’t believe it was possible for me, an American, to do this. Um, what’s so hard? The worst part was finding somebody who would go to the village as opposed to the camp.